Welcome to the world of digital media where ad placements are driven by numbers, CPM, click throughs, and gross impressions...people not so much. When things get automated weird juxtapositions come up. Did Toyota actually sponsor Detroit's unemployment? Obviously not, but they did sponsor the ad that ended up above a news story about it. The positive community theme of the ad is out of place on top of a photo of a run down Detroit neighborhood. Sorry Toyota, not your fault. It's impossible to predict what content will appear where on any news site and with automated ad placements you can never be sure where your ad will end up. It's just how these things get done in digital on Madison Avenue these days. Here is a great study that can make the connection between brand building and immediate sales. A member survey of the Association of Proposal Management Professionals, yes there really is an association for everything, discovered that when a proposal is accompanied by a strong brand that is consistently presented, it is simply more successful. Use it on a sales call. Brands sell. Doesn’t every client know this? While they may agree with it intellectually that does not always motivate them to shift dollars from their selling functions (sales staff, CRM solutions) to brand building tools (brand advertising). 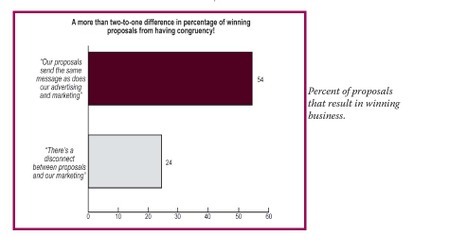 This study can make the the connection: a better brand consistently presented equals more accepted proposals. "Considering the fact that branding can account for more than 30 percent of the value of a company, protecting the brand by sending a consistent message in presentation materials is critical." "When prospective clients read proposals, they look for the brand to assure them that the company will stand behind the promises it makes in the proposal and that the quality of products and services specified are backed by the brand." 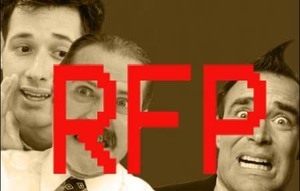 RFPs are a game. As a best practice for buyers, RFPs simplify the buying process and weed out media that is off the mark allowing more time with more appropriate media. But with buyers under pressure to make decisions more quickly, RFPs get misused. When they become the primary tool of evaluation, insightful media buying sufferers. James Hering writing for The ClickZ Network back in 2003 posed this summation showing both sides of the sales desk. "So I'm supposed to tell you why my site is better than the 180 other sites that received an RFP?" "Great, another 'we expect totally out-of-the-box thinking' proposal!" "Gee, we get a grand total of two hours to pull together a rock-solid proposal that nails the objective. How convenient." "We're honored to be invited to be a strategic partner and meet the client's long-term goals with the exciting test budget of $5,000?" "Why don't publishers respond to my requests in a timely manner?" "Ten seconds after emailing the RFP, I get a call with questions for the same information that's noted in it. Didn't he read it?" "I asked for a proposal with a limit of $20,000, yet I get a package for $50,000. What's up with that?" "I clearly asked for specific targeting criteria, yet 80 percent of what they're offering doesn't meet the stated objectives." Respond appropriately. If the RFP is not clear about where questions should be directed, find out how you can inquire, then provide questions in written form. Read the proposal from top to bottom at least twice before you ask your first question. You'll be amazed at how things can become clearer after a second reading. Meet the request. Sure, you've got sales goals, but be sure to totally address the request first. Then, provide additional options. Let's face it, almost everyone loves options. Still, we all get turned off if our initial request is overlooked. Nail the request (including the budget), then up-sell all you want. No rug-pulling, please. Make sure the inventory is there when you sell it. If it's perishable, just make sure the buyer knows the details and any corresponding restrictions. Nothing will drive a buyer insane faster than getting a client excited about an opportunity only to have to call back 10 minutes later with an "Oops, we didn't have all the details" apology. Just keep in mind, every time you get an RFP someone is inviting you to do business with them!